I hope you all have fresh sunscreen in your medicine cabinets. 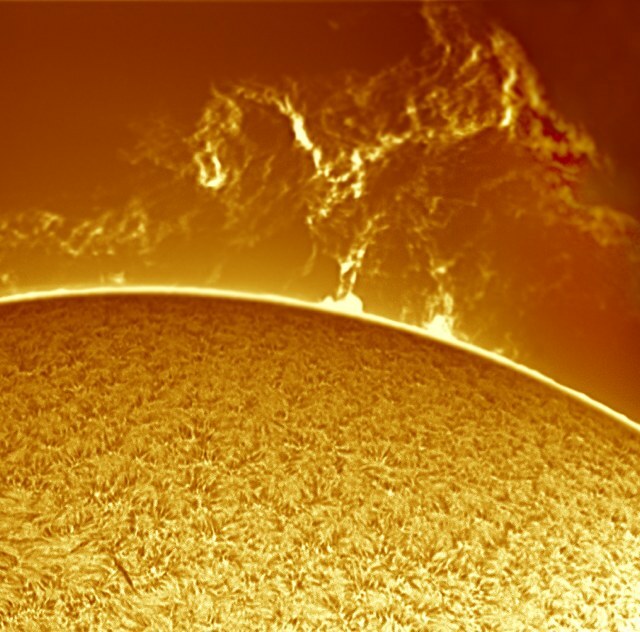 Yesterday, a massive solar prominence in the shape of a bucking bronco erupted from the sun. This mind-bogglingly huge explosion sent a coronal mass ejection hurtling toward Earth's magnetosphere. It should be delivering a 'glancing blow' sometime around Saturday. According to a report released last year, a period of intense solar activity in 2012 coinciding with an 'unusually large hole in Earth's geomagnetic shield' could be curtains. Entitled "Severe Space Weather Events — Understanding Societal and Economic Impacts," [the report] describes the consequences of solar flares unleashing waves of energy that could disrupt Earth’s magnetic field, overwhelming high-voltage transformers with vast electrical currents and short-circuiting energy grids. Such a catastrophe would cost the United States '$1 trillion to $2 trillion in the first year,' concluded the panel, and 'full recovery could take 4 to 10 years.' That would, of course, be just a fraction of global damages.